I'm an equal opportunity food-scarfer, and there's nary a cuisine I've tried that hasn't had some aspect of it that I enjoyed. But I do, I'll admit, play favorites. And there's no doubt about it: during the six years or so that I spent living in the Southwest, the sun-drenched, spicy, earthy flavors of the region's Mexican-inspired cuisine snuck their way into my soul. Living in the cold rainy UK now, I'm a long way from my old home in the scorching desert. Fortunately, though there's not a whole lot I can do to import that blue-sky good weather I miss so much, I can still recreate some of my favorite foods, getting a little taste of the Southwest sunshine with every chile-packed bite. 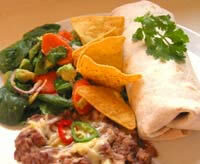 Here's one of my favorite menus: chile colorado, homemade refried beans and a lime-spiked avocado and spinach salad. 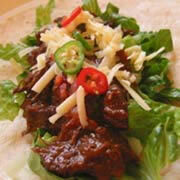 Add a big margarita and enjoy! Note: Both the beans and the beef make excellent leftovers, and can be frozen if you like, so I always make the big quantity even when I'm just cooking for me and the boy. This is your basic Mexican red chile beef, and bears pretty much zero resemblance to the stuff most of us refer to as chili. Don't get me wrong; I like the Americanized tomatoey-bean chili just dandy, but this is entirely different, and hits the spot dead-on when I'm looking for something that reminds me of when I lived in the Southwest. You can use the same red chile sauce to stew pork if you prefer; as for the chiles, feel free to substitute other medium-hot dried red varieties if you like (I've used anchos and Anaheims with fine results; dried chiles can be found at Mexican grocers, or ordered online). 1 First wash the chiles to get rid of any lingering debris. Pull off the stem, then shake out the seeds. Toss the deseeded chiles and a cup and a half of water in a pot, and bring to a boil. Remove from heat and let it sit for about five minutes, until the chiles are nice and soft. 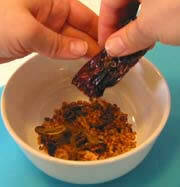 Pull out the chiles with a slotted spoon, but don't toss the soaking liquid. Give the soaking liquid a very little taste (careful: though these aren't terribly hot as far as chiles go, they still pack some heat); if it's bitter, it can go down the drain, otherwise, toss about a 1/3 cup in with the chiles in a small mixing bowl (if you've had to ditch your soaking liquid, substitute a 1/3 cup of fresh water).